And how nice is THAT?!! Kate was holding down #1, #4 and #5 on the paid list and #5 on the free list. 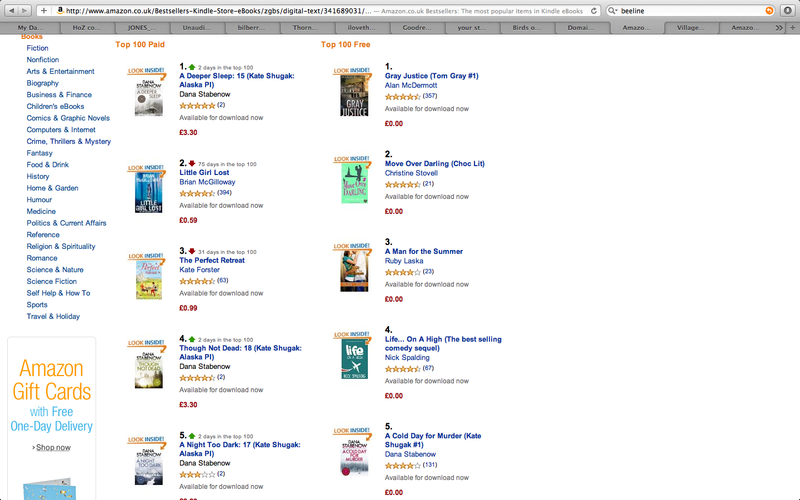 Thank you, Amazon.UK, and thank you, UK readers! I read Bad Blood in a day. Kate rocks. I’m just sorry I’ve caught up now and have to wait until the next one. Thank you Dana for a character that is as near to my heart as Sherlock Holmes. Kate kicks arse and is a very positive role model. Oh, those UK covers are pretty! I couldn’t agree more, Erin. I’m so lucky! I had at one time caught up on Kate books. And life happened and they are now in a box in the back of a storage building. But I have recently caught up with technology and bought a kindle. I knew that the first books I wanted were the Kate books and I have started reading them again. It was like coming home to an old friend. Thank you for bring her to life. Thank you for the lovely compliment, Kathy. I just finished rereading all the Kate books and can’t wait (isn’t it overdue???) for the next book. I am now going to reread the Liam series, hope a new Kate book comes out soon. Miss her, Mutt, Jim and all the other Park Rats something terrible! Kate21 comes in 2016, Mary. Hang in there! Thank goodness I reread the books as well, I wait patiently or not.